What a great gift from my Dad. At a time when I was starting to feel bored with my surroundings he sent me this book in the mail knowing that I would see inspiration within it. 8 Girls Taking Pictures is inspired from 6 real life women photographers (Imogen Cunningham, Ruth Orkin, and Lee Miller to name a few), that helped influence the last 100 years of the photographic industry. 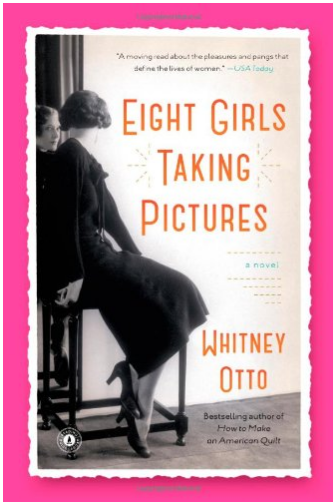 Looking into the obligations, struggles and dreams of 8 woman, Otto beautifully brings to focus the complicated but often serially simplified perception of the roles of woman with art, family, and a woman’s place in the workplace in the 20th century. Grete Stern’s story told with liberties through the character of Charlotte Blum, is especially heartbreaking. Charlotte’s story begins at her workplace in Germany in 1927; where she designs window displays and advertisements for a popular department store. Besides the attention paid to Charlotte’s ideas of challenging gender rolls of housewives in the displays she creates, a greater plot develops when Ines, a lesbian artist takes notice of the displays. The two become involved over decades of time in a twisted plot involving love, a shared photography business, relocation due to racism and the lolls and highs of creative success. What I enjoyed most about Charlotte’s story however was the thought provoking ending. Finding herself in Argentina in a heterosexual marriage with a child, and Ines a continent away, Charlotte is forced to make a choice between creative fulfillment in a unhappy marriage or true love. You might be surprised by her final decision. I listened to a radio interview with the author soon after I finish the book and an interesting fact came to light about the real life women the characters were based on. Through Otto’s research she had found that all of the photographers had a very special relationship with their fathers. Despite the rolls that society was pushing girls to stay domestic and boys to become the breadwinners of future families or the fact that some of the girls had brothers who also needed the attention of their fathers, none of that seemed to matter. For one reason or another, the daughter always seemed to be the favorite. The birth of the artist always began with a father creatively nurturing the dreams and potential of a daughter. Trust and Love. I can’t help but thank my Dad for doing the same for me. A quick read for those traveling or living abroad. Pavone pulls personal experience being a spouse of a employed wife who’s work recently took them abroad. 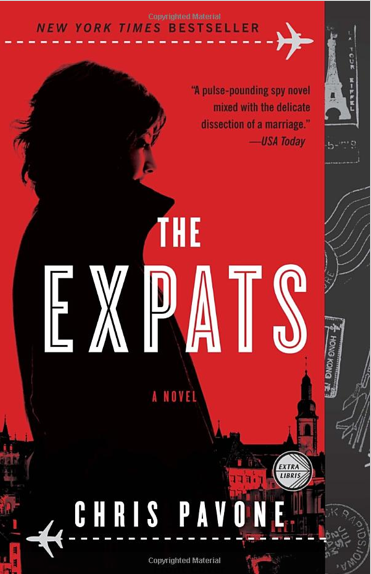 Through his leading character Kate, he touches upon subjects pertaining to reinventing oneself and finding your own footing when starting a new life abroad. One part Spy thriller, one part self discovery makes this book a fun easy going read and easy way to pass time in an airport. Author Mario Benedetti, a native Uruguayan, writes a taste of spanish culture offering the reader a look inside the mind of a native. The countries written about are nonspecific, just as the points of view from lead spanish characters vary from a Military Captain to a house pet. At first I found his POV changes from each story a little bit jarring, but his strong depiction of multifaceted characters remains the holding thread to connect the short stories together. Often his characters’ flaws and discrepancies are at the forefront of a storyline; highlighting conflicting conversations taking place inside the POV’s head. From Listening To Mozart we hear a similar dialog of a Captain Montes during the time of the dirty wars in South America. He drowns himself in Whisky and Mozart every night, trying to forget his evil deeds of the day. After his young son Jorgito asks “Dad, is it true you torture?” we hear the inner conflict of a seemingly ruthless, emotionless man. 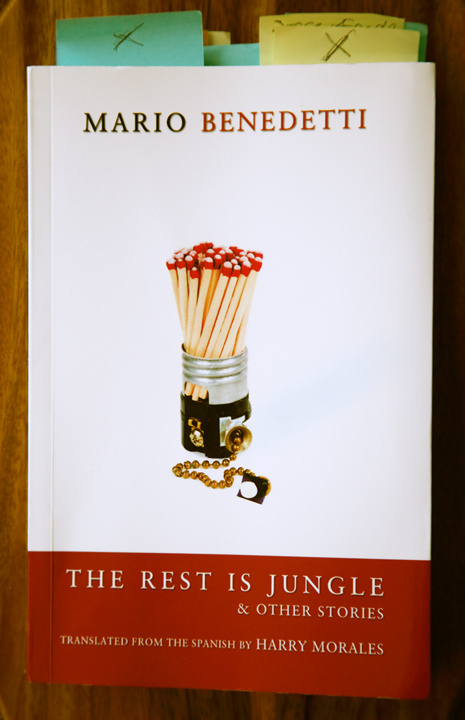 Benedetti writes about a very sensitive subject and challenges the reader to see the man behind the Captain’s mask of “duty” who struggles to find justification for his own actions.